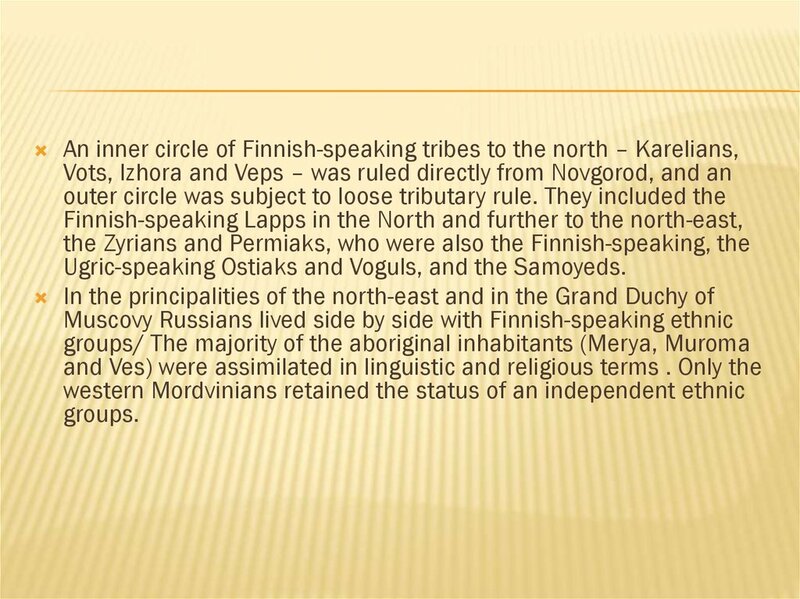 Ugric-speaking Ostiaks and Voguls, and the Samoyeds. have been russified to a great extent. already been reached by Russian settlers. 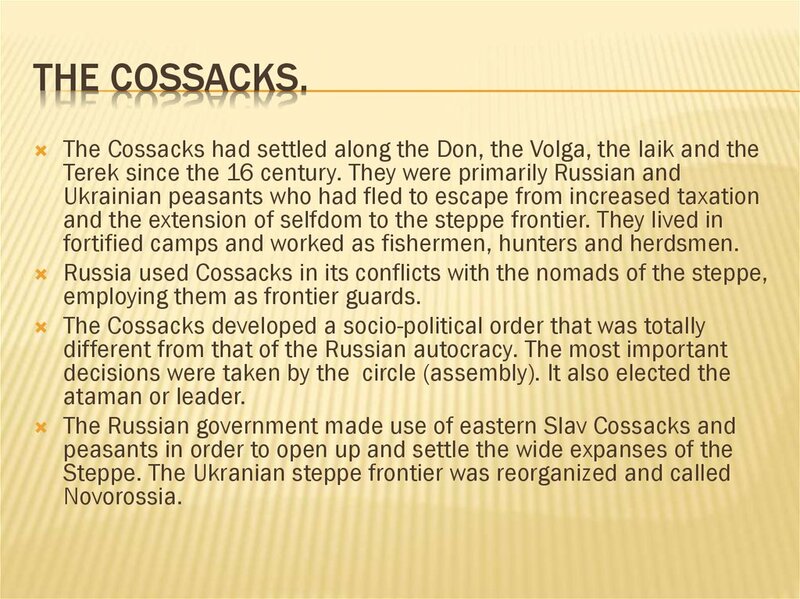 bank of the Volga was incorporated into the Muscovite State. 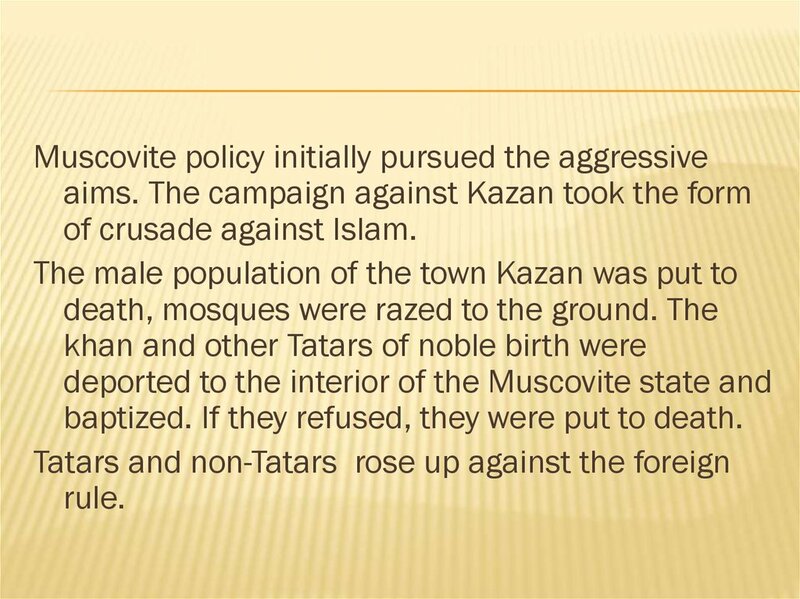 khan had failed, that the decision was taken to conquer Kazan. 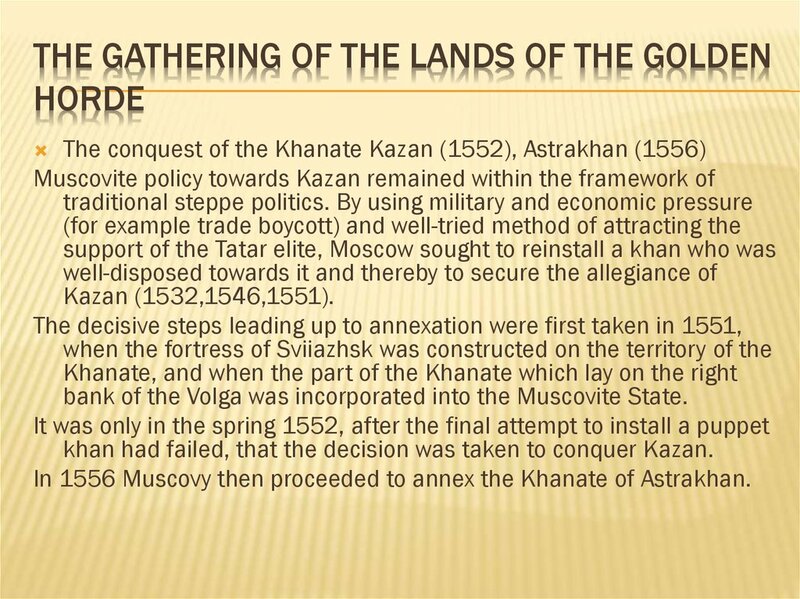 In 1556 Muscovy then proceeded to annex the Khanate of Astrakhan. baptized. If they refused, they were put to death. 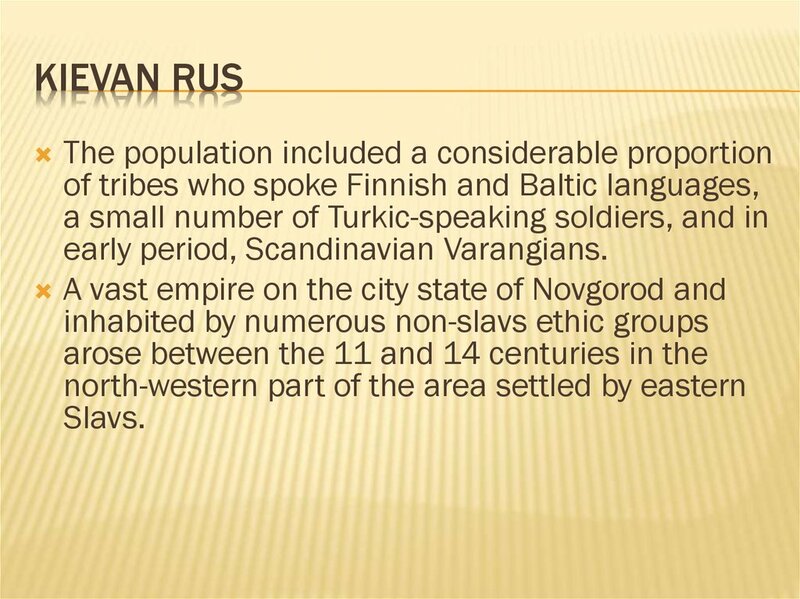 Novgorod and Muscovite policy towards non-Slav ethic groups. Revolts were consistently put down with military force. separate central department (Prikaz Kazanskogo Dvortsa). 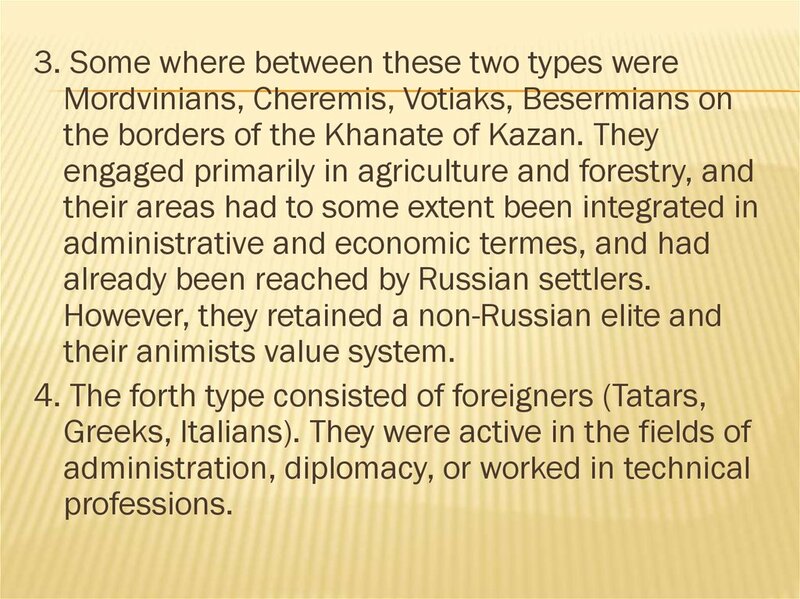 to the khan or to aristocrats was given to Russian noblemen. 11. 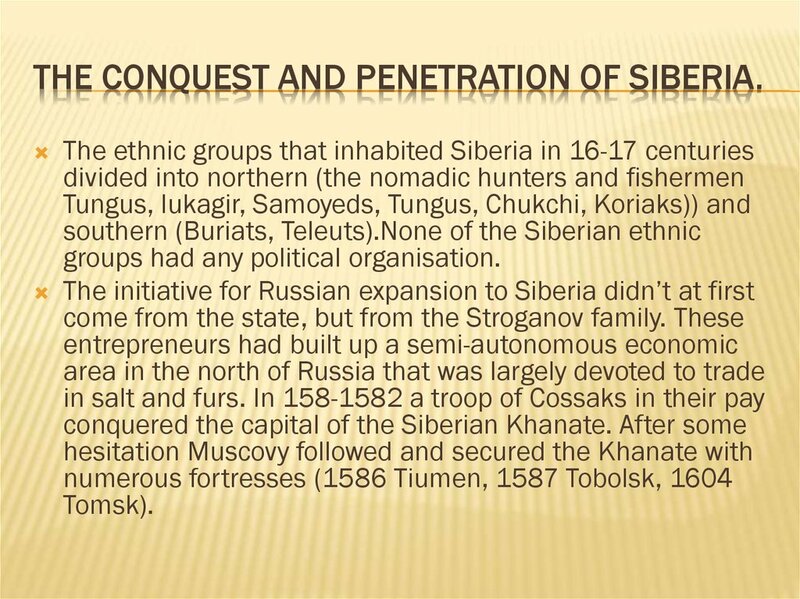 The Conquest and Penetration of Siberia. 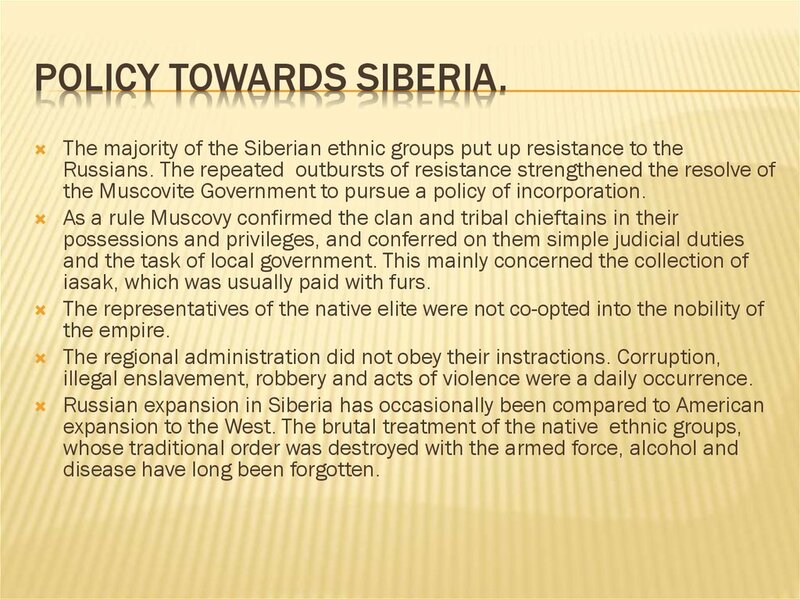 THE CONQUEST AND PENETRATION OF SIBERIA. groups had any political organisation. 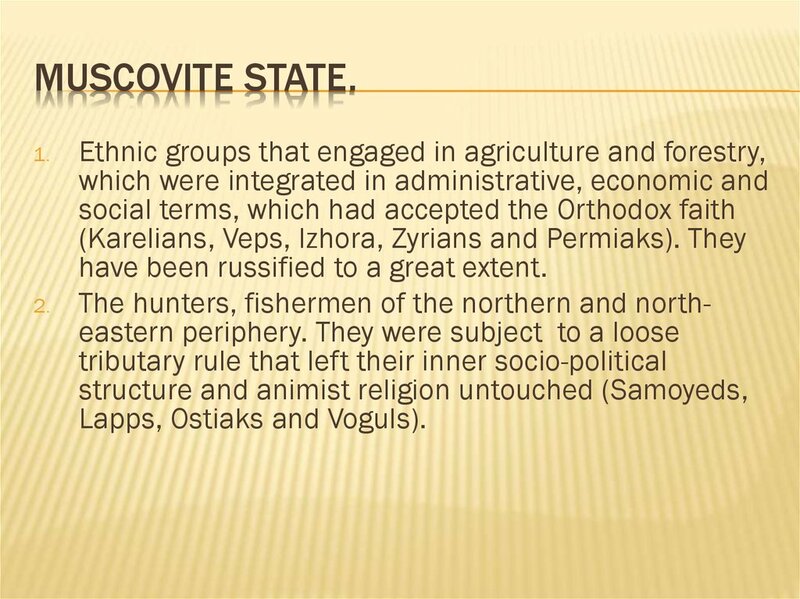 the Muscovite Government to pursue a policy of incorporation. iasak, which was usually paid with furs. illegal enslavement, robbery and acts of violence were a daily occurrence. disease have long been forgotten. herdsmen. They were organized in clans and tribes. 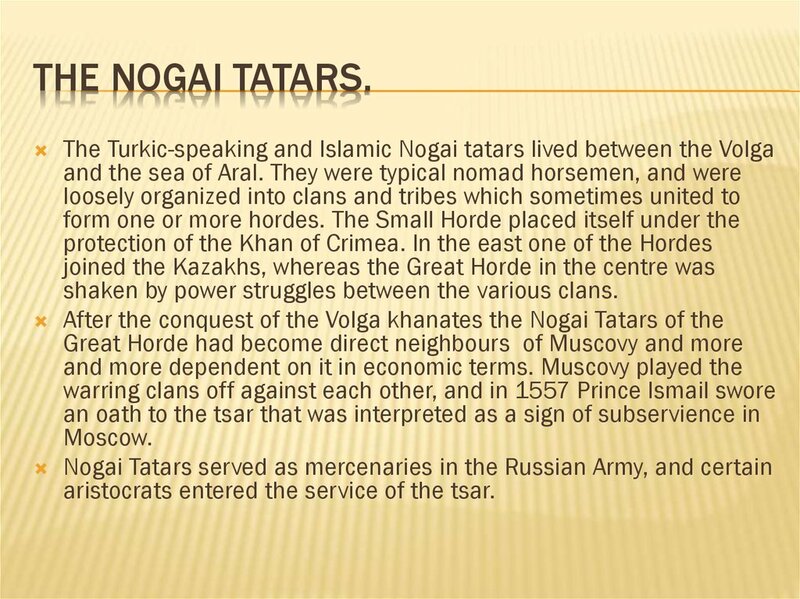 tribal chieftains entered the service of Muscovy and paid iasak to the tsar. 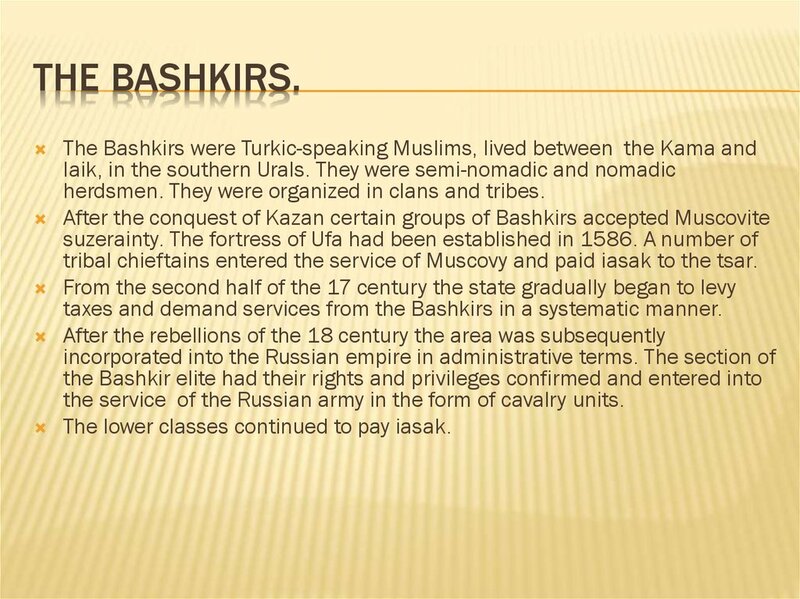 taxes and demand services from the Bashkirs in a systematic manner. the service of the Russian army in the form of cavalry units. The lower classes continued to pay iasak. shaken by power struggles between the various clans. aristocrats entered the service of the tsar. 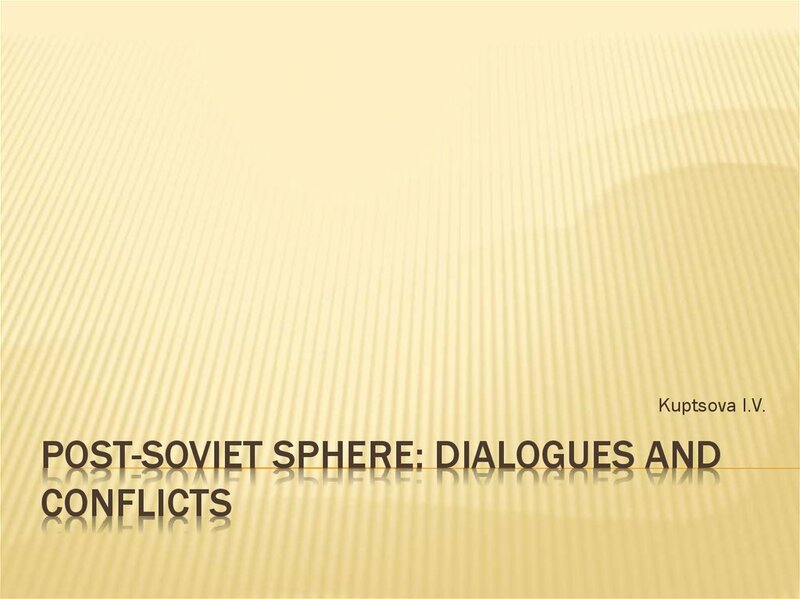 military alliance in the context of the politics of the steppe. 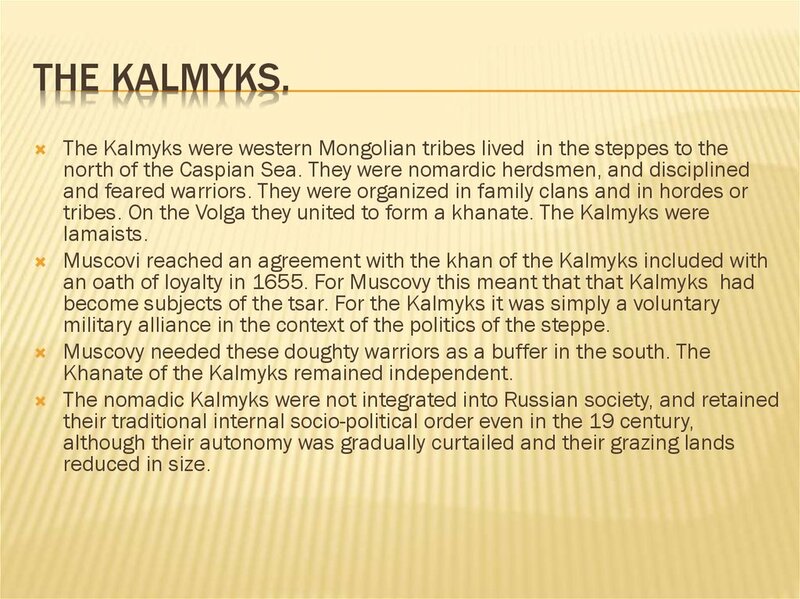 Khanate of the Kalmyks remained independent. given them by the Ottoman Empire. 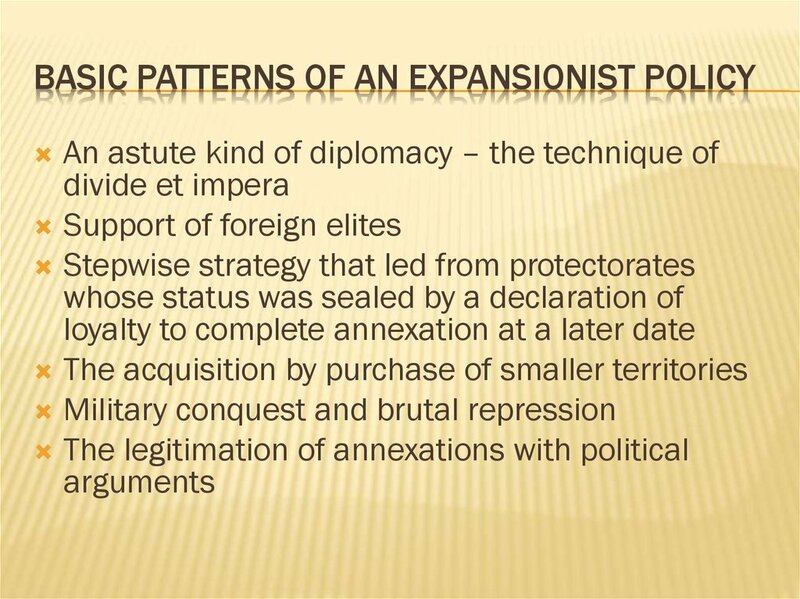 and it became more and more dependent on the Sultan. 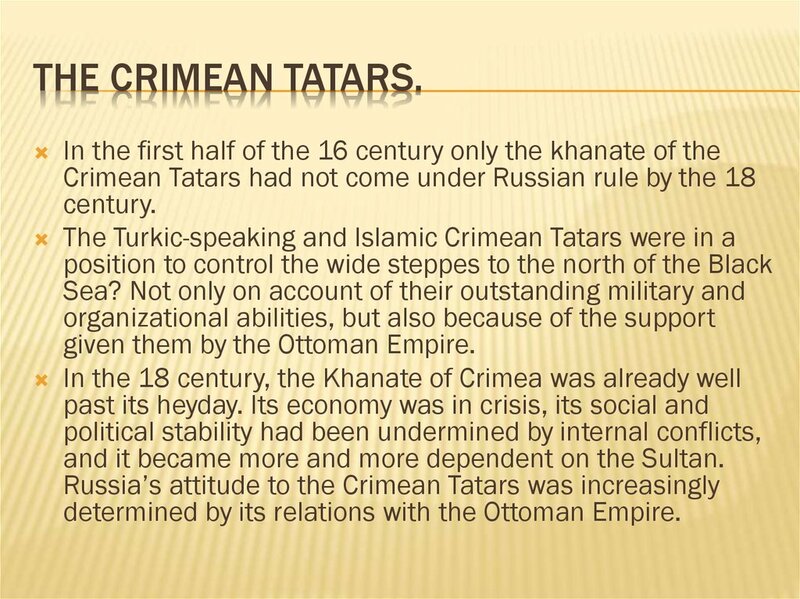 determined by its relations with the Ottoman Empire. ventured on to the Crimea itself. 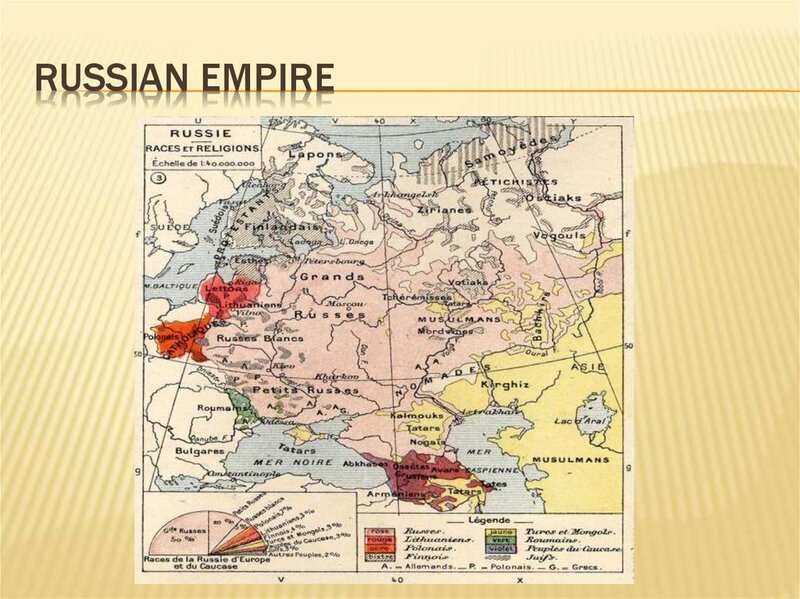 stood alone against the might of the Russian empire. 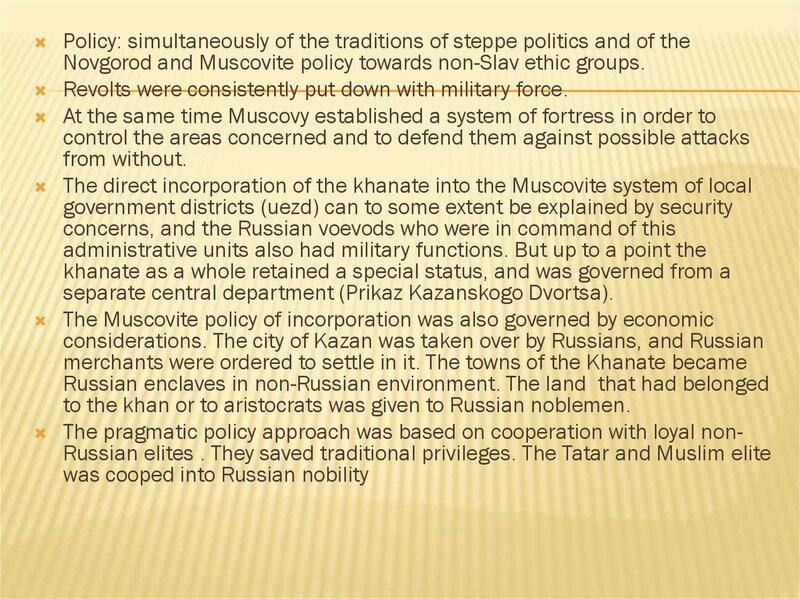 the Khanate as a free territory dependent on no one. 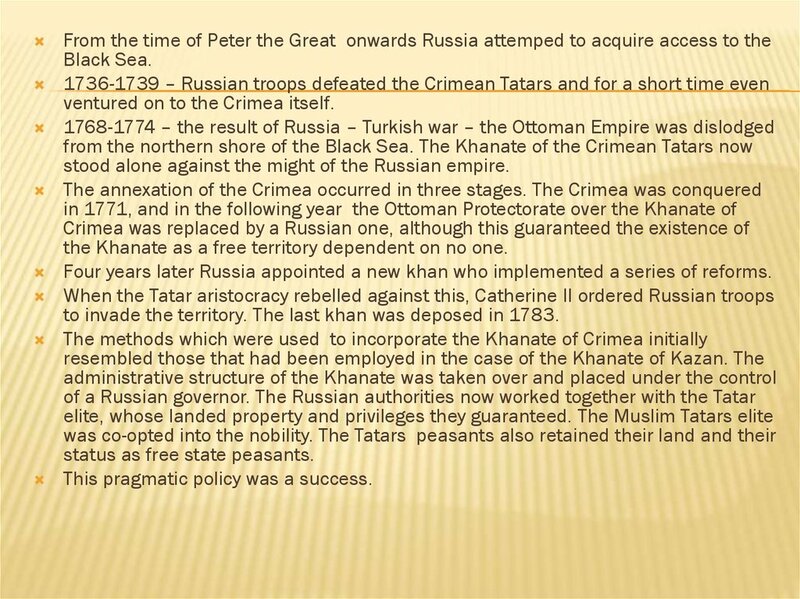 Four years later Russia appointed a new khan who implemented a series of reforms. to invade the territory. The last khan was deposed in 1783.
status as free state peasants. This pragmatic policy was a success. fortified camps and worked as fishermen, hunters and herdsmen. employing them as frontier guards.